The exposure showcase held at The Phhacility October 19, 2018 was a huge success and will now become an annual event. The report will be broken down by class and each player will have an evaluation. Here is the breakdown of each player in the exposure camp, if we missed someone inadvertantly, please feel free to let us know. Veronica Ruiz 5’6 Combo guard, Victor Valley High School, Victorville CA- Veronica Ruiz has improved every time we see her play, Ruiz is a shooter that can knock down the three ball consistently and can also score in transition. 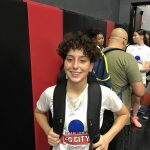 Ruiz has improved her ball handling and passing and is a solid defender. Ruiz was a second team all Desert Sky selection last season and looks to improve upon that this season. 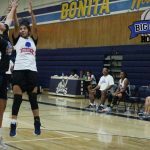 Ruiz deserves a look at the next level and we anticipate she will be playing college ball next season. Ryan Jenkins 5’5 Point Guard, Foothill High School, Henderson NV- Ryan Jenkins is a heady point guard who can control the tempo of game and effectively run a team. Jenkins is a solid defender who uses her bball IQ to cut off passing lanes and create steals. Jenkins is an above average ball handler and can shoot out to the three stripe or penetrate and dish. Jenkins played extremely well in the camp Allstar game. 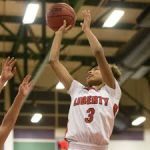 Journie Augmon 5’10 F/G Liberty High School, Henderson NV- Journie Augmon is an intriguing prospect as she can play the guard position and the forward positions. 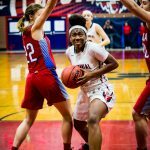 Augmon handles the ball well and runs the floor and uses her quickness to out run defenders and score at the basket in transition. Augmon rebounds well and makes several baskets using her length. Augmon is receiving interest from schools at several levels, and should be off the board by the end of this season. 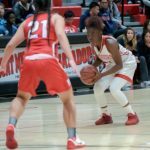 Michelle Corley 5’6 CG Mount Miguel High School, Spring Valley CA- Michelle Corley is a strong, physical combo guard that defends with intensity. Corley can handle the ball and can play the #1 position if need be. Corley can shoot the ball out to the three point line and can drive and finish in transition and off of most offensive sets. Corley continues to improve every time I see her. Evelyn Young 5’7 CG Baboquivari High School, Sells AZ- Evelyn Young is a solid prospect who is fundamentally sound and possesses a high basketball IQ. Young competed well and showed that she can handle the ball under pressure, can see the whole court and seems to make the right pass at the right time. Young has a nice mid range jumper and can knock down her shot from the three stripe. 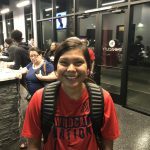 Tenacious Garcia 5’5 PG Westwood High School, Mesa AZ- Tenacious Garcia is a nice left handed point guard who uses her athleticism to gain positioning on defenders and either pass to the open player or score off the dribble. Tenacious Garcia has a nice jump shot with a nice quick release, making it hard for defenders to guard. Garcia plays adequate defense, but can Make up for it due to her speed. 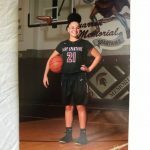 Jamia Clark 5’9 F Centennial High School, Peoria AZ- Jamia Clark is a solid forward who knows how to use her body to create space and rebound as well as core underneath the basket. Clark runs the floor well and defends by using her length and size, while in transition. Clark has a nice mid range shot and handles the ball well. Clark will be a big part of Centennials season this year. 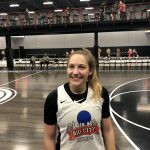 Brenna Pillsbury 5’7 PG Anthem Preparatory Academy, Anthem AZ- Brenna Pillsbury was the surprise of the showcase as Pillsbury who aveeraged 23PPG last season showed that she can play, by exhibiting exceptional ball handling, passing, rebounding and defensive prowess. Pillsbury can shoot the mid range and three ball with consistency as well as get to the basket with a variety of moves. Pillsbury plays at a smaller school, but make no mistake, she can compete with anyone. 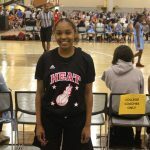 Aliyah Hanley 5’6 Combo Guard, Cimmarron Memorial High School, Las Vegas, AZ- Aliyah Hanley is a solid combo guard who has a knack for being in the right position at the right time. Hanley is a solid defender, who can guard multiple positions as she is athletic enough to cut off the passing lanes to the basket. Hanley has adequate ball handling skills, but excels in the open court and in transition. 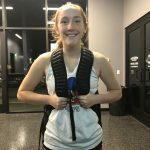 Allyson Blair 5’5 Queen Creek High, Queen Creek AZ- Allyson Blair is a tough competitor who has above average ball handling skills and nice court vision at the point guard position. Blair competed well at the showcase and showed a knack for playing fundamentally sound basketball in a competitive and uptempo atmosphere. Blair shoots the ball well out to the three strip and can rebound as well as be an efficient passer, we think Blair will have a big season for Queen Creek this year. 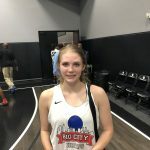 Summer Fox 5’8 G Pueblo High School, Tucson AZ- Summer Fox impressed evaluators with her hard physical play, ball handling, rebounding and shooting abilities. Fox can handle the ball, defends exceptionally well and rebounds at a high clip on both the offensive and defensive ends of the floor. Fox also showed that she could get to the basket and finish with contact. Most importantly, Fox is a high energy player who motivates other players around her. Look for Fox to have another big year for her Pueblo High squad. 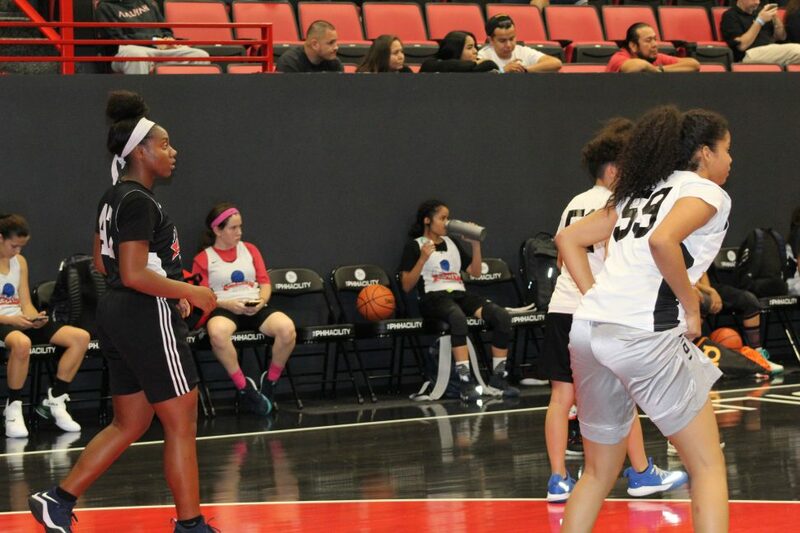 Awa Sidibe 6’0 West Coast Wings Academy, Phoenix AZ- Awa Sidibe is another athletic player from West Coast Wings Academy who is athletic and can handle the ball and rebound, sidibe plays hard on the offensive and the defensive ends of the court. Sidibe is a little raw, but can shoot the mid-range shot and can finish near the basket. Not much is known about Sidibe but we will keep an eye on her this season. Angelina Selespara 5’5 Eldorado High School, Las Vegas, NV– Angelina Selespara competed with intensity and played hard on both ends of the floor. Selespara shot the ball well and rebounded. Selespara is an adequate ball handler and a good passer. Bryar Tronnier 6’2 Centennial High School, Las Vegas, NV- Bryar Tronnier was scheduled to play but unforeseen issues while enroute to Phoenix prevented her arrival. Nonetheless Tronnier comes from a great program and is well coached. We will get a look at Tronnier this season, but coaches should also take a look at Tronnier as well. For further Info DM me and I will provide updates.